The January 2019 transfer window ended in disappointment for Leeds United when the proposed deal to bring Daniel James from Swansea fell through. However, other than a flurry of activity on social media and brief reports on various websites, the collapse of the deal was not major news outside of Leeds or Swansea. Wind back to 1971, imagine if Twitter had been around - the news that stunned Don Revie, Leeds United and the whole of English football would have crashed the servers at Twitter Towers and the social media platform would have hit complete meltdown. In the late 1960s, a new star of West Midlands football was making waves. Born in Clydebank, Asa Hartford was an emerging talent at West Bromwich Albion plying his trade in the First Division. It was a time when every team had a hard man (George Best famously stated that Leeds had 11 of them) and Hartford, a tough tackling midfielder could certainly look after himself. He was the pin-up boy at the Hawthorns and with his fan mail out of control, an Asa Hartford monthly newsletter was distributed to all supporters who were club members. Hartford claimed that had it not been for his ability to pay football, he would have more than likely ended up working in the shipyards of Scotland where times were very hard. Asa had joined West Brom straight from school and the disappointment of being left out of Albion's team to play Everton in 1968 FA Cup Final, fuelled his desire to succeed and he was soon making rapid progress in the game. Before Don Howe took over at West Brom in the summer of 1971, Hartford's previous manager, Alan Ashman had claimed that the young Scot would become one of the best strikers in the First Division, although he was playing him in midfield. In the early part of the 1971-72 season, Don Revie saw as many players in the treatment room as he did on the training ground. Leeds United, fighting for the right to become Champions of England, had been forced to play the first four home games of the season, away from Elland Road and took on a Tour de Yorkshire with two games at Leeds Road, one at Hillsborough and one at Boothferry Park. Points were dropped and injuries were mounting. Revie, played a weakened side in the UEFA Cup and Leeds were beaten by SK Lierse over two legs. West Ham knocked his side out of the League Cup at the Third Round stage and with a crippling injury list, The Don needed reinforcements. The key figure he had in mind was Asa Hartford and on the 3rd November 1971, Leeds got their man. The Birmingham Daily Post reported the news in the Midlands and it was made clear that the move would not go down well with the Albion faithful. "Hartford has certainly not been sold because we need the money. We've never had a bank manager worry us yet. I cannot comment on replacements." The paper reported that the transfer had been completed with Leeds' usual secrecy. Don Revie had met Albion's chief scout, Paddy Ryan, and Hartford on the East Lancashire road between Liverpool and Manchester. Terms were quickly discussed and agreed and the deal had been signed at around 4 o'clock. "We have long admired him. He will be of tremendous value to our first team squad. He is in the same mould as Billy Bremner and Alan Ball, a fiery type of player that can win the ball and use it constructively. "I consider I have got a lot for my money in Hartford, one of the most exciting young players I have seen. He has the ability to play equally well as a striker or midfield player." The signing of Hartford was not the only business that Leeds did that day. It was also announced that striker Rod Belfitt had been sold to Ipswich Town. Depending on what newspaper you picked up, the fee was increasing from the initial £160,000 and although some reporters were quoting slightly lesser amounts, the Liverpool Echo claimed that transfer fees were in danger of spiraling out of control and the columnist called the fee "staggering" whilst stating that Hartford was no more than an average First Division footballer. The following day, Asa Hartford reported to Elland Road for training and he had disclosed to the media massed at the ground that Revie was not a fan of long hair and had ordered his new signing to visit the barbers before representing his new club. It was also announced that after his debut, Hartford would be travelling to an FA disciplinary commission in Birmingham, where he would be represented by his former club, to answer to three bookings within 12 months. Leeds were in danger of losing Hartford's services for some weeks. He had previously been in front of the suits following a red card in a FA Youth Cup tie against Sunderland. That dismissal brought about a two week ban, he had also been sent off on two other occasions. Life was seemingly good for Asa Hartford, not only had he signed for Leeds United, he received a Scotland call up for the forthcoming game against Belgium. Archie Gemmill was forced to withdraw and Asa got the nod. However, his life was turned upside down and the football world was rocked on the Friday evening before the new signing was expected to make his debut the following day against Leicester City at Elland Road. Leeds United dropped a bombshell and announced the transfer had been called off for medical reasons. Initially, neither the Leeds Chairman, Alderman Percy Woodward or Revie would disclose the details and the Albion Chairman said he understood that Asa Hartford would not be playing football for the foreseeable future. The Leeds United Secretary and General Manager, Keith Archer confirmed that the cheque had not been signed as the club had been waiting on the results of a medical and any further comment must come from West Bromwich Albion. Whilst Leeds took to the field against Leicester, a game they won 2-1, Hartford, who had travelled back to the Midlands, was watching Albion's game against Stoke from the Directors box, refusing to comment on the unexpected situation that had left him devastated. "I stood between two cars outside Leeds City station and cried like a child. It was the worst experience I have encountered because I had to tell this brilliant young footballer his career was threatened according to specialists that examined him." "The club doctor found an abnormality and this was later confirmed by two specialists at Leeds infirmary. I don't want to say what is wrong with Hartford but it's not just a temporary condition." "I have an unconfirmed report that it is a hole in the heart. There are certain degrees in this condition and in Hartford's case I cannot imagine it to be really serious." In a rare display of compassion, the FA postponed the disciplinary hearing for a future date. Less than a month later, Asa Hartford was back at Elland Road as he lined up for West Brom in a game which United won 3-0. He perfomed admirably that afternoon, receiving a warm welcome from the Leeds supporters and following the game, speculation was rife in West Yorkshire that the deal would be back on. However, any hopes that the fans had were rapidly extinguished by Revie and Leeds United. Asa Hartford was subjected to a few further medical tests, he did not require any form of surgery and he went on to enjoy a good career in football. 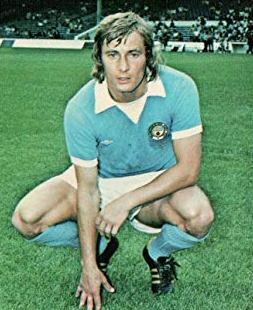 In 1974 he signed for Manchester City (pictured above) where he won the League Cup Final, an achievement he repeated whilst playing for Norwich City in 1985. He had two spells at Maine Road and in addition to City and Norwich, he also played for Nottingham Forest, Everton, Bolton Wanderers, Stockport County, Oldham Athletic and Shrewsbury Town and between 1972 and 1982, his country came calling and he represented Scotland, winning 50 caps. Who knows what might have been for Asa and Leeds United. The signing that never was.